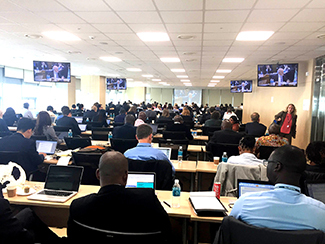 Recently Humana has participated in the fourteenth meeting of the board of the Green Climate Fund in Songdo, South Korea, to contribute to discussions on the management of the fund and publicize its work in the countries most affected by the consequences of climate change. The international community established this fund to improve support to developing countries in mitigating and adapting to the effects of global warming. Its mandate passes to mobilize around $10,000 millions annually by 2020. It aims to facilitate access to developing countries to finance lines which often have no access. The Green Climate Fund began funding projects in 2015, but its implementation is not without difficulties. In fact, some of the most affected countries as well as smaller non-governmental organizations have reported certain bureaucratic barriers that hinder their access to funds.